Bodies sweat and drums pound as the air vibrates. Feet stomp the ground and torsos arch to the sky in rhythmic patterns. Left, right, body sides forward and backward, the studio is filled with dancing. The colorful skirts, percussion and expressive movement attract me. Many faces appear joyous and the teacher smiles, loving the chance to share culture through the form of dance. West African dance is: movement jumping, waving, turning, dancing low and high, using body halves, sides, and cross lateral developmental patterns. 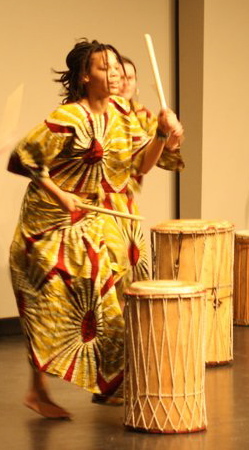 Many technical steps found in Western dance genres also occur in African dance. The form is complex and exciting yet widely misunderstood largely because we live in a world where binaries made by people in power, continue to define dance in hierarchies and divide the art into high and low categories. Sometimes cultural dances are referenced as something as “other,” which is not the same as “high” and is therefore devalued, which is shocking to me, because I find African dance enormously technical. Once I told my Ghanaian dance director that if I had to place another dance form near ballet, I would choose African dance more then modern or contemporary. A different philosophy compared to many trained ballet dancers I have crossed who believe the two forms are antitheses. Contrary to many stereotypes, there are various levels and sophistications in African dance. Similar to ballet history, different African dance styles stem from different masters who come from different countries and villages. I find Guinean dance to be quite complicated rhythmically and physically and the approaches vary from each instructor. I have done Sonsorne at least five different ways and learned many different steps depending on which teacher I am practicing with. Like the country, African dance is diverse. Dances come from Guinea, Ghana, Senegal, Ethiopia, Rwanda, Tanzania, Zimbabwe and many other countries. No one can fully know the entire variety that exists within the form without over simplifying. Most Western research and resources are put towards analyzing the art, craft and history of ballet and modern dance. African dance research is lacking and the form continues to be somewhat degraded for its contribution to the dance world even though many great American dance artists were heavily influenced by it. But the beauty of African movement is real and it is this aspect that is widely cherished. 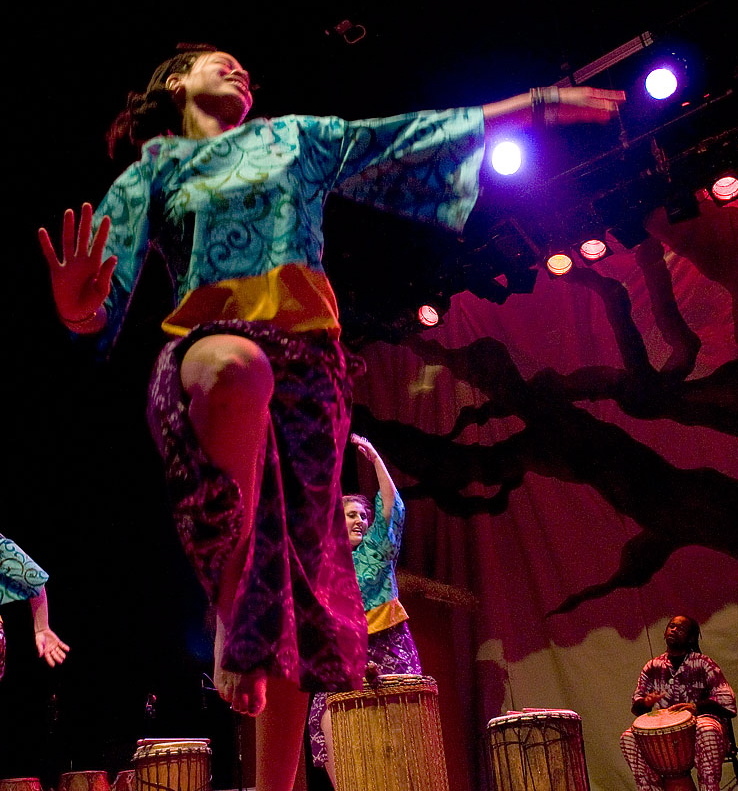 The thrill, excitement and complexity of African dance keep it alive all over the world. People are and remain interested in wanting to learn African dances. I became curious about African dance to further discover my heritage and ancestry, because a part of me was enticed to reclaim an aspect of self, stripped away with colonization. An equally significant motivation was the amazing feeling I receive when I am caught up in motion, rhythm and spirit. The more I perform African dance, the more I discover and enjoy euphoria. When the drums are beating and the body is dancing everything fits in sync and I feel limitless and powerful. Through the execution of the dance steps, I am able to align my mind, body, spirit, rhythm, heart and essence along with those supplying the music. Even if live music is not present, the sense of the rhythm happening in my body and my body creating its own music is riveting. Dancers tend to be happy participating in African dance, and the form allows their bodies to release. Releasing is positive. Letting go of any thing we are holding onto as extra baggage through dance is healing. Dance medicine conditions our mind and body to stay balanced and focused. African dance gives medicine that everybody can benefit from whether they are African, African American, a person of color, European, or of Asian descent. Human beings benefit from letting go and finding the spirit within. I think this is one of the reasons countless people enjoy doing African dance. African dance has its own unique way of feeding the soul. In February I will be teaching African dance classes at the Dancing with the Sacred Rhythms in Nature retreat. I am imagining how wonderful it will be to dance in Costa Rica in an exquisite and sacred environment surrounded by lush tropical rainforests, mountains and trees. I can already hear the music pulsing, and I sense an outpouring of spirit, love, and support for our journey. In addition to African dance I will lead Movement, Meditation, Mindpower, which combines Hatha yoga, meditative practices and Alexander Technique and dance in nature in other sacred sites. Like African dance, our bodies, minds and spirits are complex and interconnected. All of these practices will feed into each other and correlate with the larger parts of this journey. To join us, be sure to register by January 17th. Cherie Hill is a full-time dance teaching artist at Luna Dance Institute in Berkeley, CA and a freelance choreographer and performer. Her research interests include dance, the African Diaspora, somatics, and feminist theory. She is Co-Vice President of Sacred Dance Guild, lead author of sacred dance trends and a mother of two. Visit her website at http://iriedance.com/. I am a songwriter based in England, just finished recording my own composition song called ‘Dance With Spirits’, which will be released worldwide in a couple of weeks. The song is about giving thanks and respect to nature, which was borne out from a heavy bereavement period from losing my wife to cancer, then wanting to give respect back to mother earth and nature. The song lasts for 11 minutes and 55 seconds, as the beautiful instrumental music,section with drum beats from around the world driving the rhythm, with guitars, wind pipes, sitar, synthesiser performing dancing, trancing and meditative solos. I wonder if you could consider to supply me with any images that you may have, relevant to this theme, which I could use for a Youtube video with my song. Your image depicts some of the atmosphere and ambiance related to my song I am trying to capture. Your name and website could appear on the image, offering you attribution and additional advertising potential, as a returned gesture. Could you contact me with your thoughts, so we could find a mutual way to compliment each other’s theme.